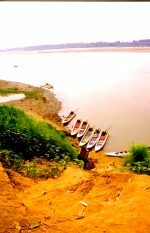 The Mekong, the 12th longest river in the world, flows sluggishly between Chiang Khong in northern Thailand and Huay Xai in Laos, its brown waters lapping into banks heavy with mist. It seems a fitting place to start a journey in Laos  closed to the world for so long and now opening its doors in welcome  rather than the more popular routes near the capital. There is an air of adventure, of stepping into the unknown, though the crossing has been used for hundreds of years  by traders, migrants, opium traffickers, refugees, bandits and so on. Chiang Khong, if not Huay Xai, is gearing up for the rush expected over the next few years. But it is only the few who trundle across northern Thailand and arrive, buying their visas and ferry crossing from one of the half-dozen agents, to get into Laos through the back door. At the moment, the Mekong is the only feasible route from Huay Xai to Luang Prabang, the world heritage town of temples, 300 miles to the east. And there are two options: the slow boat, which takes about three days and the fast boat, which rockets along at 50mph and, even with a pit stop, gets you there in seven hours. The problem with the slow boat is that women are confined to the inside, while men are allowed to luxuriate in the cooling breezes on the roof. So, according to those who have used it, the dream of exotic relaxation palls in the face of discomfort. The fast boat does not offer comfort either ... but, for excitement, it ranks with the best. Once you have your border entry sorted out, handed over £100 in exchange for more than half a million kips, you can lug your bags up the hill to where the jumbos  vehicles like large tuk-tuks  are waiting. They will take you the few miles to the fast boat terminal  or the slow if that is the way you are going  which is not much like Dover. It is a brick structure, where you can pay your fare or haggle for a whole boat, and a steep mud slope to the Mekong 50ft below. There, the fast boats are moored. They are beautiful. Sleek, highly-decorated state-of-the-art craft designed and built in Thailand with the telltale propeller shafts stretching 15ft into the water. Or, put another way, they are oversized rowing boats with an enormous car engine bolted in the back, open and uncovered with the petrol stored in plastic cans between the engine and the passengers. They carry six passengers but some cram in eight or more. Even at six, there is not much room for such a ride for Europeans who tend to be bigger and less supple than the Laotians. 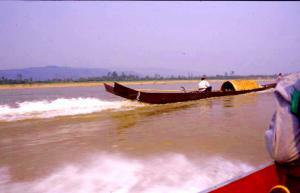 We hired a boat between four  look out for sharers in Chiang Khong or at the ferry crossing  for £100. The operator kitted us out with crash helmets that would not fasten and lifejackets. They did not take it too seriously: the locals do not bother but falangs, by law, are forced to wear them after a Thai tourist was killed. Then we got on with the trip. And, wow, they were not exaggerating when they said they were fast. The shock and exhilaration hits you as the driver, sitting behind, opens the throttle and the roar of the engine adds to the sensation of rocketing off across the cobblestones of the choppy water. The boat settles into a steady pace, picking its way through the rock bottlenecks, swerving round plastic bottles tied to unseen obstacles, and bouncing over the swell from boats coming the other way or from turbulence where rivers join the Mekong. As the excitement wanes, the real beauty of the Mekong becomes apparent. The jagged hills, shrouded in mist; the sparkle of the sun off the river. And, from time to time, the people who live there, clinging precariously to banks below the flood level and growing a quick harvest in the silt to augment the fish from the life-sustaining waters. There was a brief stop to get our papers signed by the internal immigration officials. Failure to go through that formality could have resulted in a fine and, worse, being sent back from Luang Prabang to get the right signature. It was a moment to savour the river, the Laotians travelling on the river and pausing for their own formalities. Someone extracted a boat, untying ours, and it started drifting off, unnoticed, except by the sole passenger sitting in it while changing a film. An hour later, deafened and battered, we pulled in, alongside a floating noodle bar, at Pakbeng. The more sedate slow boats moor there overnight but, fast is fast, and we got a one-hour pit stop. We sat there, watching a group of local mums watching us, and nearby three local lads were elaborately striking poses while hanging out with bottles of drinks. Outside, over the Mekong, the hills loomed, both beautiful and mysterious. We clambered over the other moored boats, got in our own and, with a roar, we were off again, heading eastwards. As the sun began setting  disconcertingly ahead of us  we reached our eastern destination: the terminal for Luang Prabang. A host of hopefuls scrambled down the bank, as steep and high as the one where we started the journey, to carry our bags. The light was going, the young driver wanting to be on his way, a small fishing craft nosing its way into the landing place. If there is a paradise, it must have something like the Mekong.